One long, final starboard tack took us well inshore towards the small Yemeni settlement that we could see set against the background of dry desert wilderness. 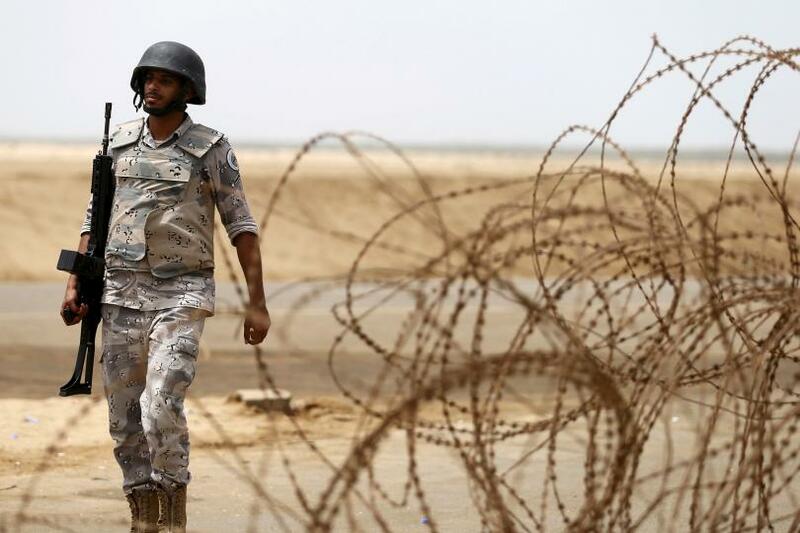 We both knew full well we would be in deep trouble because we could see a large military post with armoured vehicles and the Yemeni flag fluttering strongly in the wind. With the sun now rising strongly in the sky we sailed slowly in a now much more gentle breeze. We reefed our mainsail and prepared to drop anchor whilst still under sail. It was surprisingly easy going and as soon as we registered around six metres on our depth gauge Marie let go our anchor and at the same time I released Sänna’s mainsheet to lose power from the sail. Our anchor set immediately and we came to a gentle halt in total calmness. Everything was quiet. We could see people moving around the settlement as we were anchored less than five hundred metres from shore; there was a group gathering along the sandy beach although they didn’t seem to be taking any particular notice of our presence. Of course, we were wrong. Marie wisely suggested that we tidy everything below and get some rest before something happened… at this point we’d not slept for nearly three days. Within half an hour we stowed away everything ship-shape as best we could and then were soon fast asleep on top of our nice, cool, comfortable bunk. A lovely breeze blew through the open cabin hatch. Then frenzied banging on the hull instantly woke us from our exhausted slumber – we had no recollection of how long we’d been asleep but I myself didn’t feel refreshed at all. I guess it was probably no more than thirty minutes. The sun was still up high when I stumbled up the companionway steps into Sänna’s cockpit. There was a large skiff alongside us full of around a dozen ramshackle soldiers, most of them armed and pointing their weapons in my direction. I think they were as alarmed as I was. One of them began shouting loudly at me in Arabic but I had no idea what he was saying – although he didn’t seem particularly threatening. Marie then joined me and stood there in the hot sunshine beside me. They all started babbling and laughing, pointing their guns at Marie who because this was a fiercely Muslim country had wisely covered herself as best she could. It was Marie who broke the ice, telling them that we were an English sailing boat and we’d been badly damaged in the big storm. They were all silent except for the same guy who again shouted in Arabic; maybe he was their officer in charge, it was hard to tell. Then, to our great surprise, one of them spoke calmly in good English. “Do you know this is a restricted area? You are not allowed here,” he said. It took a few moments for this to register because it was entirely unexpected. Marie again reacted first, she was clearly much calmer than I was. She once more apologised and explained why we were there. The English speaking soldier spoke in Arabic to the one who’d been shouting and they had a long conversation. “Where is your captain?” he then asked. Marie told him there was only two of us onboard but he obviously did not believe her. Another long conversation then took place within the skiff and four of the soldiers made as if to come onboard. Marie stopped them. They were instantly perplexed but straightaway obeyed her command. I was impressed. The officer and the English speaking soldier both laughed and said something in Arabic. Then they all laughed. “Is this man your captain?” the interpreter asked Marie. Yes, she told him. After around five minutes of another long conversation between them the interpreter spoke to me directly. “You must come with us. Is this woman your wife?” Recalling our earlier problem with the Suez Canal pilot and the sensitivity of Muslim law, I lied and told him yes, we were married. I didn’t want to complicate an already bad situation. I’d not given a thought to our marital status before dropping our anchor here and this, we both suddenly realised, could easily turn into a real problem. Then the interpreter laughed. “We think your wife is maybe captain, yes?” I laughed and then everyone in their boat laughed too… as if they understood! But a few moments later the interpreter beckoned me into their boat whilst telling Marie she must stay. This was bad, I really didn’t want to leave Marie alone onboard Sänna, not without knowing what was going to happen to me. She reassured me, saying that we had no choice and that she’d be ok. I climbed into their skiff and two of them straightaway took hold of my arms whilst two others pointed their weapons in my direction. I was now anxious, tired and extremely worried about what was going to happen but then the interpreter told me not to worry. He asked where in England I was from… this small friendly gesture reassured me and I relaxed, for some reason I no longer felt threatened. We then sped away with Marie waving goodbye, she looked extremely forlorn standing alone in Sänna’s stern so I waved back. Every soldier in the boat waved back too. I laughed. They all laughed too. We landed onshore, tying to a ramshackle and crumbling jetty in the small village where a large crowd had gathered. As I climbed out of the army boat around five or six of the villagers pointed Kalashnikov looking rifles in the air and fired rapidly, shouting loudly in Arabic whilst their women shrilled their voices in that strange warbling way that I’d heard before on news TV. The soldiers didn’t seem overly concerned though and no one made any moves to harm me. I was worried, Marie was bound to have heard the sound of gunfire – what would she think? She could only think I’d been harmed and by now she would certainly be in a real bad state with worry. In the meantime I was led through the village followed by a large crowd of locals and taken towards the small desert fort that looked like something from a Beau Gest novel. I was led up some stone stairs on the outside of the two storey building that was the largest in the village and which seemed to be quite important. On the flat roof the Yemeni flag flew, and either side of the dilapidated square building stood two enormous army tanks, their guns pointing out to sea in the exact direction of Sänna. “Why are you here?” the big commander then asked calmly in good English. I once again explained our situation but I had the distinct impression he’d already been told anyway. I told him about the storm, that we had no diesel for our engine and we’d been damaged by the big winds. He said nothing whilst both the interpreter and the other officer talked to him in Arabic. Then, he told me to sit in the rickety chair before his desk; there was now at least twenty of us in the room and they all stood back to allow me to sit down. The officer from the boat again shouted something in Arabic and around fifteen or so Kalashnikovs suddenly pointed in my direction. The big officer behind the desk then said something abruptly and all fifteen weapons turned away and everyone seemed to relax. Then, to my surprise, I got some coffee. I was actually beginning to enjoy this confrontation because my instincts told me that I was not under any great threat, but, of course, that could quickly change. The big officer, who spoke good English, asked why we had no diesel and I explained our situation back in Eritrea and Port Sudan. He didn’t say anything but didn’t question what I’d said either. Then he talked to the other officer, a long conversation that everyone else in the room was listening to as well. Then nearly everyone suddenly left the room except for the commanding officer, the interpreter and the other officer from the skiff. The three of us sat and talked awhile, he asked about Marie, how long we’d been married and where we were we heading. I told him we were making for Aden but now needed to wait for good northerly winds to get through the Straits and that we could then repair our sails when we arrived in Aden. I asked what was going to happen to us. The interpreter turned to me, saying that the soldiers from the skiff were outside draining diesel from the two large armoured vehicles standing outside. They were themselves short of diesel but they were going to fill a barrel, take it to the skiff and then take me back to my boat. I was stunned. In the meantime I got more coffee. Then something strange. The interpreter told me they were all very proud that I’d named our boat after the capital city of their country. I suddenly twigged… the capital of Yemen was Sanaa, Sänna herself was sitting serenely on anchor not a quarter of a mile away. We stayed there on anchor off Al Dhubab for five days recovering from our experience in the big storm. The Yemenis, the same officer, interpreter and soldiers as before returned me to Sänna in their skiff, with over two hundred litres of diesel drained from three of their army tanks. The big commanding officer had asked for ten US dollars for the diesel, I offered more but he wouldn’t take it. When I got back to Sänna Marie was incredibly relieved to see me and told me she’d cried when she heard the gunshots whilst I was onshore. I laughed, and showed her the big barrel of diesel that was being maneuvered to Sänna’s stern from where a manual pump was being prepared to get the diesel into our tanks… these Yemenis did everything themselves and told me they didn’t need my help; an hour later our rear diesel tank was nearly half full. The interpreter asked if we could give the soldiers something for their hard work, they were very poor he said. Marie bought out my large collection of hats and they laughed with genuine pleasure as they shared them around amongst themselves. When they later sped off in their skiff the interpreter was wearing my favourite Jamaican Rastafarian hat and the officer my Turkish fez, the sparkly one with mirrors and dangly tassels. The others wore various hats I’d collected on our travels. They all waved to us in genuine friendship. Over the next couple of days we received a daily supply of fresh baked bread, some not particularly fresh fruits and various other offerings like papaya juice. The interpreter, Mohammad, came often and we sat and talked about England, how he’d learned English at school and how the British were still admired from the colonial days in Aden. There was still a proud statue of queen Victoria in Aden, he told us, which was still meticulously cleaned every day. After we’d fully rested, been thoroughly excepted by the villagers of Al Dhubab and the military personnel of the local army outpost we pulled up our anchor to finally head for Aden. This time the winds were more benign and unusually in our favour. We passed through the Straits of Bab Al Mandab hugging the Yemen coastline on the advice of the army commander; he said there were Somalian pirates around and they’d tried to attack an oil tanker only the day before. The sea was flat calm with no appreciable wind to set our sails, so we turned on our engine content with the thought that we now had more than enough diesel to reach Aden. The two day sail was uneventful except that we were approached by a small fishing skiff which, at first, we suspected may be Somali pirates. In the event they were Yemeni fishermen who wished to give us fish and we took two nice sized yellow-fin tuna from them in return for some cans of Pepsi. They refused beer saying it was against their religion to drink alcohol. 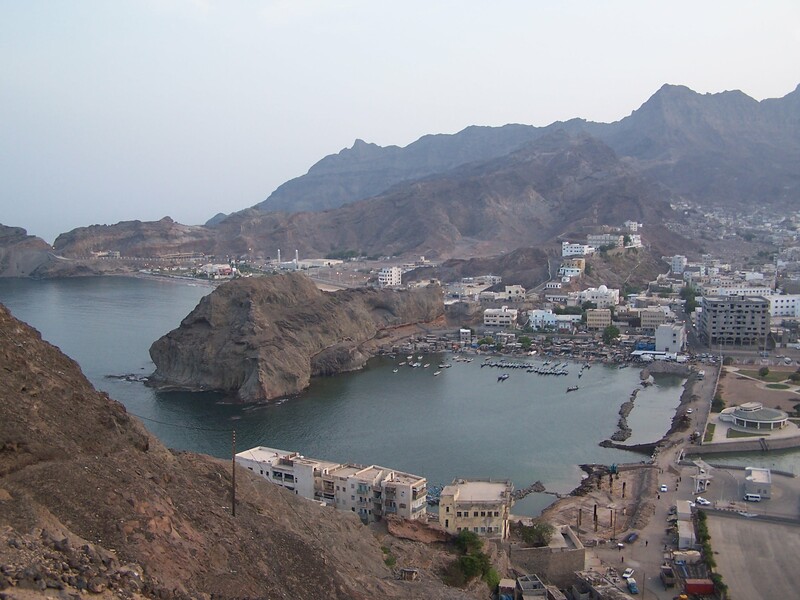 Aden, it turned out, was a real jewel. We anchored off the Prince of Wales dock and went to see the harbourmaster. We were intercepted by various locals offering to assist us but we already knew from Rod Heikall’s cruising guide that the local Mr Fix-it was a guy called Omar and that he would soon find us. He found us very quickly… and the other local fix-its quickly disappeared. Omar took us to the harbourmaster and then to immigration. Then came rather officious Yemeni Customs and a compulsory visit to the local naval commander for his permission to stay in Aden Harbour. He was another big guy and straightaway asked, “Are you the English boat that was in Al Dubab?” We told him that we were and he laughed, offering his hand and kissing Marie twice on her cheeks. He said I was a fortunate man, that my wife was very beautiful and asked how long had we been married. I told him the usual lie. The he asked me how many wives and children did I have? I told him about my three daughters, that I was thankful for only one wife and about Marie’s son Henry. I saw in his eyes that he was working things out. We’d been divorced. Then he said to me, “You are lazy. I have two wives and twelve children with each of them.” Marie replied, asking him if he could remember all of their names. He laughed loudly. “No,” he said. He liked Marie and eventually started sending her flowers every day… but more about that later. Anchored close to us were the Germans Peter & Dagmar in Iltis. 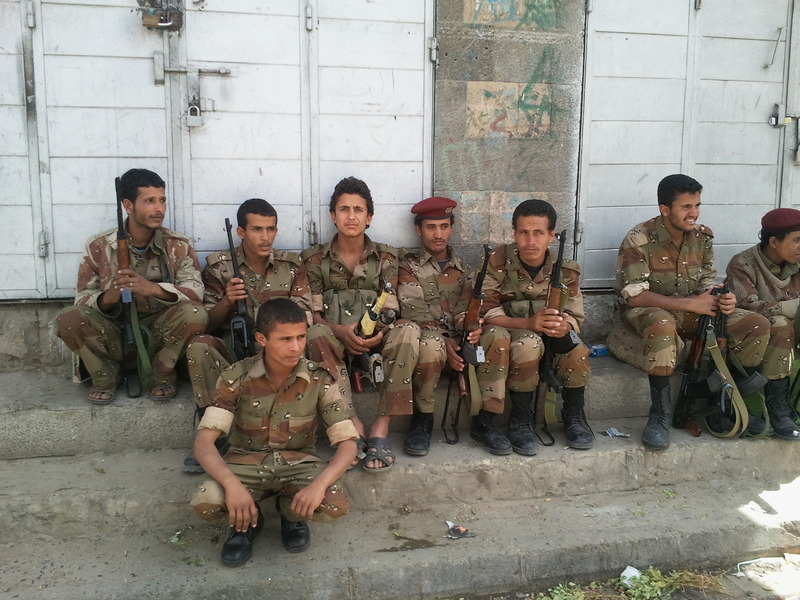 They’d been in Aden for several weeks and knew the place extremely well. 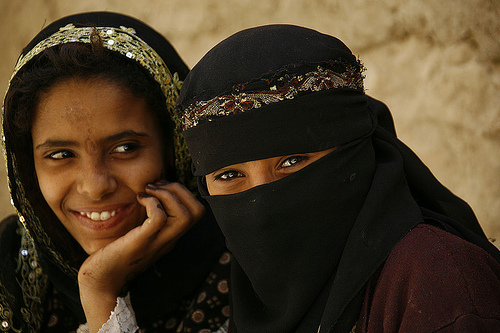 Dagmar also spoke Arabic and had already made friends with local women who were clothed head to foot in black burkas, Yemen is extremely conservative when it comes to Islam and its strict customs. Nevertheless, the friendship of the locals was exceptional and we experienced no problems. Marie and Dagmar had to keep themselves covered as best they could though and were the only females around who’s faces and hair were uncovered. Also anchored in the harbour was the American yacht Pipedream 9. I had a score to settle with the skipper of Pipedream 9.